Charles Kern, also known on social media as “look at that bus”, is a co-owner and founder of Chrome Yellow Corporation. His story starts in Denver in 2008 when he co-founded and began managing operations for Bus to Show—a non-profit bus company aimed at reducing the social impact (drunk driving, carbon footprint, etc) of nightlife and entertainment events. 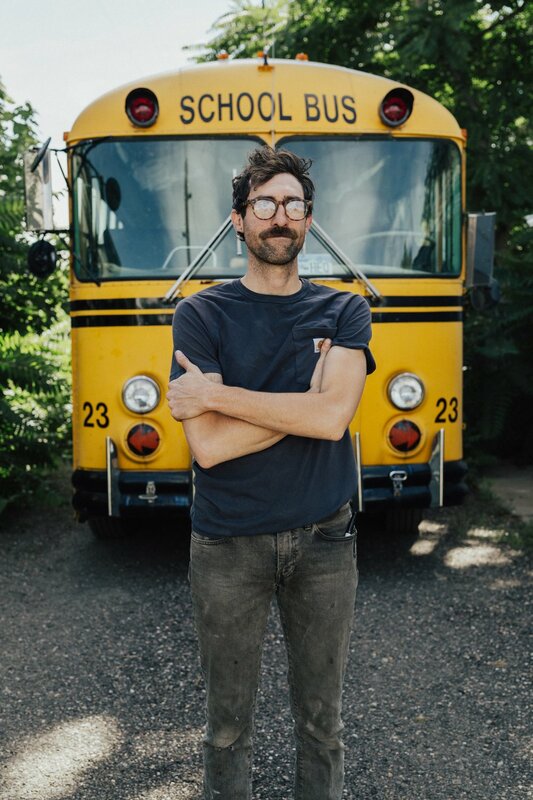 After several years of fleet management, Charles’ passion transpired to sustainable living in what he knew best—school buses. To learn more about Charles, read his autobiography here. Born and Raised in Arkansas, Ben Jackson is the co-owner and co-founder of Chrome Yellow Corporation. He is also our lead carpenter for our rough ins and full turn key builds. At the young age of nine, Ben has always had some sort of tool in his hand working with his granddad who ran a saw mill in his south Arkansas. His unique contributions span from cabins to school buses and he has a special talent in understanding exactly what a customer’s vision is for custom wood cabinetry. Ben Jackson has awed our clients with his outstanding ability to match the curved contour lines we all lament in a school bus - please see his work on our portfolio page. Also from Arkansas, our metal fabricator Ty Holter specializes in roof raises, custom entry doors, and various transmutations. Moving to Colorado at 18 years old, Ty picked up jobs at fabrication shops throughout Denver while going to college. His fabrication skill set ranges from custom outdoor furniture to custom trailer hitches for pesky rear engine vehicles. His most recent work involved custom bunk beds that float in the air, maximizing the living space of a school bus. Ty is always looking to doing something not yet tried in a school bus. We are proud and excited to have the skill set Ty brings to the table and his approachability with our clients is something we all learn from. Jess Webb is an educator, an artist, musician and idea maker. She grew up converting vans into tiny homes with her dad. At our shop, Jess masters the art of subfloor installation, along with custom cut sheet metal for our roof raise skins. She installs RV windows, creates our templates and is an integral part of our day to day operations. Jess Webb attended Metro Denver for spacial media and art education. She has been a Denver based artist for 15 years. She is currently working on a large scale installation for Denver Meow Wolf coming in 2019. Josh bought his first bus back in 2013 for a party bus company he co-founded with a roommate in college. It wasn’t a school bus, but it’s where the road began for his passion for off grid school bus living. His off grid school bus is a 1987 International Thomas with a DT466 engine and is settled in Sedalia CO. You can see his bus on his website. Josh is our customer relations communicator and trainer as he has held his Class B CDL for 5 years and has trained bus operators in local charter school districts & private transportation companies. If you have a question about a bus, Josh is your guy!